Our family originally evolved in Africa but over the last 2 million years we’ve spread throughout the world in a series of migrations. Dmanisi in Georgia is one of the oldest hominin sites outside of Africa; dating to around 1.78 million years ago. This makes it a key site for understanding what the first of these migrants – called Homo erectus – was like1. The skulls from Dmanisi. Skull 5 is the bottom one. 4 skeletons have already been discovered at Dmanisi and they’ve revealed that these early pioneers were surprisingly primitive; considering they were “advanced” enough to survive outside of their familiar African environment. They lacked the adaptable handaxes of later species and had very small brains, only slightly bigger than chimpanzees (600 – 700 cc, compared to the 450 cc of chimps)1. At the same time they were capable of adapting to the new plans and animals they encountered2 and cared for their elderly. This raises all sorts of interesting questions over just how important big brains and advanced tools are. Earlier this month information on a 5th skeleton (consisting of a complete skull with jaw bone and possibly a few bones from the rest of the body) from Dmanisi was published, providing even more information on the first non-Africans. However, this discovery also has far reaching implications for the rest of human evolution. The new skull, imaginatively titled “skull 5”, was discovered in the same spot as the earlier finds so is most likely part of the same population. However, it is quite different from the first four skeletons, with a much smaller brain (546 cc) and a large projecting face. This shows that Homo erectus was a lot more variable than we first thought, changing how we should define the species3. As the first migrants left Africa and spread throughout the world the populations in different regions began to evolve. Since these regional variants were first discovered in the 19th century there has been extensive debate over whether or not they were different enough to be defined as a new a species, or should all be labelled Homo erectus4. In fact when the Dmanisi skeletons were first discovered some wanted to call them Homo georgicus for this very reason. By showing that Homo erectus was very variable, skull 5 definitively proves that these regional variants are not distinct species, but fall within Homo erectus. Further, Homo erectus isn’t the only species with “variants” that have been debated. The earlier Homo habilis (thought by some to the ancestor of Homo erectus) has a more robust version, thought by many to be a distinct species called Homo rudolfensis. 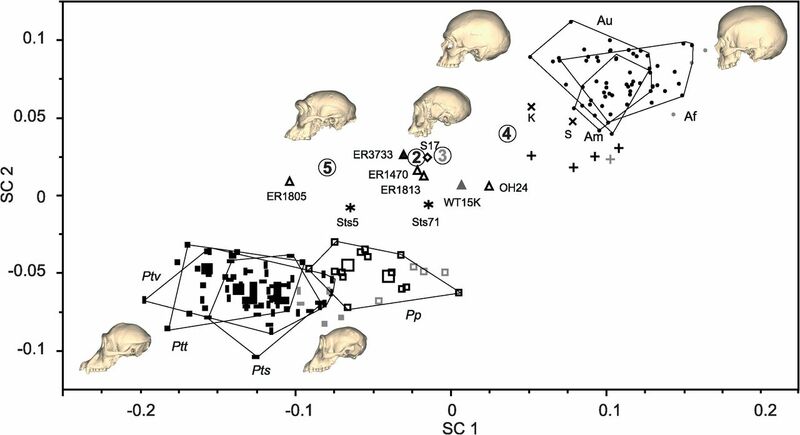 Since this new skull suggests hominin species are actually more variable, rudolfensis and habilis may have to be be re-classified as a single species. 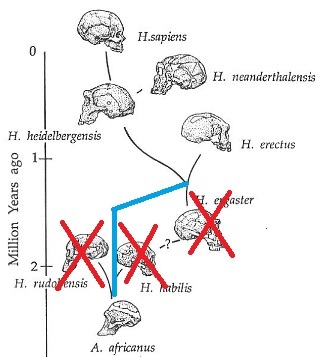 In fact, skull 5 shows that Homo habilis may even fall within the variation of Homo erectus3! However, this conclusion is strongly contested by other scientists as the Dmanisi researchers only investigated a handful of Homo habilis skulls. But since we’ve only discovered a handful of skulls I’m not sure if this is a major problem; and I have a sneaking suspicion that even Homo habilis may eventually be grouped into Homo erectus. All in all, this trimming of the human family tree may remove up to 3 different species; grouping them all into Homo erectus. However, before we go rewriting textbooks some might be suspicious of whether or not skull 5 is even part of Homo erectus, given that it is so different to the others found at Dmanisi. Fortunatley, some bones from the rest of body were also found. These show that, skull aside, skull 5 was much more like the Homo erectus we’re used to with long legs and a more human-like body. It should also be remembered that the variation now documented within Homo erectus is no more extreme than the variation seen in modern chimps or humans3! So we should start trimming our family tree. This is a major change to our understanding of human evolution so has understandably been picked up by the popular press. Unfortunately they’ve run with headlines like “Skull of Homo erectus throws story of human evolution into disarray” (from the Guardian) or “Does this skull rewrite the history of mankind?” (from the Daily Mail). However, the “story” of human evolution remains unchanged and the skulls document the same evolutionary history. All this discovery does is change the labels a bit which – whilst significant – is hardly the “disarray” that some of the more extreme headlines suggest. 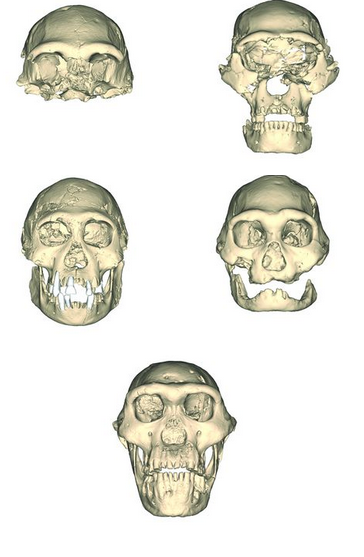 Skull 5 shows that single species of human are more variable than we thought. which means we have to trim our family tree; reclassifying some groups previously thought to be distinct species. At the very least, this will make it easier to learn the names of all of our ancestors! Gabunia, L., Vekua, A., Lordkipanidze, D., Swisher, C. C., Ferring, R., Justus, A., … & Mouskhelishvili, A. (2000). Earliest Pleistocene hominid cranial remains from Dmanisi, Republic of Georgia: taxonomy, geological setting, and age. Science, 288(5468), 1019-1025. Messager, E., Lordkipanidze, D., Kvavadze, E., Ferring, C. R., & Voinchet, P. (2010). Palaeoenvironmental reconstruction of Dmanisi site (Georgia) based on palaeobotanical data. Quaternary International, 223, 20-27. Lordkipanidze, D., de León, M. S. P., Margvelashvili, A., Rak, Y., Rightmire, G. P., Vekua, A., & Zollikofer, C. P. (2013). A Complete Skull from Dmanisi, Georgia, and the Evolutionary Biology of Early Homo. Science, 342(6156), 326-331. Boyd, R., Silk, J. B., Walker, P. L., & Hagen, E. H. (2000). How humans evolved (Vol. 8). New York: WW Norton. October 31, 2013 in Homo erectus. Newspaper headline writers are not the same as the reporters, and provide an additional layer of oversimplification and hype, as the Guardian headline, picked up with relish by creaionists, clearly shows. We expect it from The Daily Mail because of the junk science they tend to delight in publishing. I really thought better of The Grauniad though, their science reporting is often amongst the best of the mainstream newspapers. NH’s post is really good, it’s interesting to read more about the geology; a topic often under appreciated by palaeoanthropologists. It is the case that Bernard Wood, a palaeoanthropologist at George Washington University, has taken issue with the ‘one big species’ idea in the recent Science paper. He apparently objected to “[bringing] the whole bloody house down” by lumping all three species of early Homo together based on a cranial analysis alone. Of course people like YEC David Coppedge exploit or distort such talk. “The house that Darwin built must survive the evidence thrown against it”. The bit most people seem to have a problem with is the grouping of Homo habilis in with Homo erectus; which is also the bit the authors are most skeptical about. As such the disagreement is being greatly exaggerated. Paper suggests Homo ergaster part of Homo erectus, most people agree. Implies that this may cause a redefinition of Homo habilis, people disagree. Creationists pick up on this disagreement to cast doubt over the whole thing. There’s really only one species of Homo since no population of Homo has ever been regionslly isolated long enough from other members to become a new species. Homo habilis, erectus, and sapiens are simply successive chronospecies with all Homo populations exhibiting a common trend towards increased encephalization until the sapiens level of encephalization was reached. Not even floresiensis, which seems to have been isolated for a rather long time? The encephalization of Floresiensis is well below that of Homo habilis and is on the australopithecine level. So I don’t think Floresiesis is Homo. See Alba: J Anthropol Sci. 2010;88:11-48. Cognitive inferences in fossil apes (Primates, Hominoidea): does encephalization reflect intelligence? Difficult to believe that Homo sapiens was not also on the island of Flores during the last 50,000 years since humans from South East Asia were able to make it to Australia. And ancient tools suggest that Homo erectus may have started to travel to the island as early as a million years ago, presumably by raft or boat. A proper study for mankind: Analogies from the Papionin monkeys and their implications for human evolution. Am J Phys Anthropol. 2001;Suppl 33:177-204. It is the old fight between the lumpers and the splitters. Right now it is the splitters who command the field. There was no genetic evidence for a Neanderthal having lived within the last 100 years.